THE WOODLANDS, Texas – (Realty News Report) – The Howard Hughes Corp. recently broke ground on Lake Woodlands Crossing, a 62,565-SF retail center in The Woodlands Town Center. Lake Woodlands Crossing is located at the northeast intersection of Lake Woodlands Drive and Grogan’s Mill Road. Arch-Con Construction is the general contractor. CDA Architects designed the center, slated for completion late 2018. The Woodlands is a 28,000-acre master planned community located 27 miles north of downtown Houston. It is home to over 116,000 people, and more than 64,000 people work there. The new retail center is 65 percent preleased with tenants including Ulta Beauty, Stickhouse and Main Squeeze Juice Company. 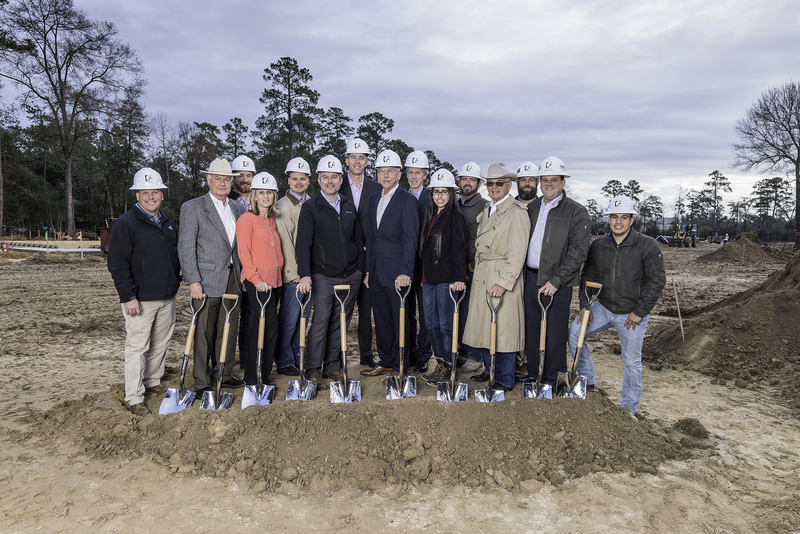 Executives from The Howard Hughes Corporation, and its wholly-owned subsidiary, The Woodlands Development Co, recently broke ground on Lake Woodlands Crossing, a new retail center in The Woodlands Town Center, with CDA Architects and Arch-Con Construction. Pictured from left to right are: Robert Schindler, Safety Director, Arch-Con Corporation; Alex Sutton, Co-President, The Woodlands Development Company; Stuart Alison, Vice President, CDA Architects; Kim Phillips, Director of Marketing, The Woodlands Development Company; Jason Ellestad, Senior Project Manager, Eric Rabel, Senior Project Manager, and Jim Carman, Vice President, Master Planned Communities, Commercial Development, all with The Howard Hughes Corporation; Tim Welbes, Co-President, The Woodlands Development Company; Rip Reynolds, Vice President, Leasing & Commercial Land, The Howard Hughes Corporation; Jeanine Lozano, Project Coordinator and Rick Florence, Superintendent, both with Arch-Con Corporation; Peter Doyle, Executive Vice President, The Howard Hughes Corporation; Greg Thompson, Project Manager, Marc MacConnell, Senior Vice President, and Taylor Davila, Assistant Project Manager, all with Arch-Con Corporation.